Institutional Review Blog: Like the blog? You'll love the book! 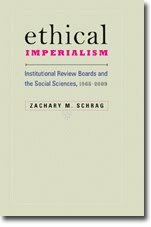 I am proud to announce the publication of my book, Ethical Imperialism: Institutional Review Boards and the Social Sciences, 1965-2009. The book and the blog are complementary. The former traces the history of IRB review of research in the social sciences and humanities from its origins in the mid-1960s through last year, while the latter documents the ongoing debate over such review. I hope that everyone with an interest in the present debate will share my interest in its past. The Johns Hopkins University Press has graciously offered a 25 percent discount to readers of this blog: please download the "Now Available" flyer. Books should begin shipping by the end of next week. Amazon sell it for a couple of dollars cheaper than the JHUP discounted price and there's a free shipping option. Thanks for pointing this out. Amazon's prices fluctuate widely and mysteriously, so it may or may not be the cheapest option at any given time.